Ah, Christmas. That wonderful time of year when you can roll out of bed to the screams and wails of children, grab a hot cocoa, and spend several hours arguing with an 8-year-old about which LEGO set to build first. Simply magical. While you’re waiting for the Doctor Who Christmas special to come on, settle down with these wonderful Christmas-themed builds that came in over the last few weeks. Here’s an interesting way to spice up your seasonal headwear. [Mark] took a Santa hat and added a string of multicolored LEDs to the brim. The lights were picked up at a drug store for a dollar. Control is through a simple push button connected to an ATtiny13. Press the button, the lights cycle in a different pattern. Very cool, so check out the video. 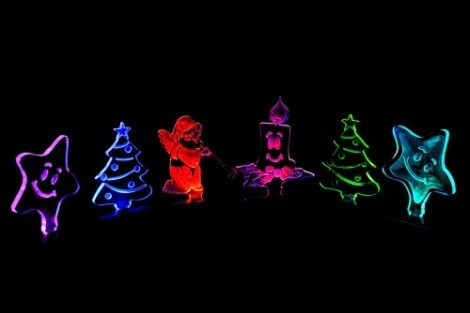 [Auger] posted this very cool light up Christmas tree decoration on Instructables. This tree is made up of three pieces of acrylic. 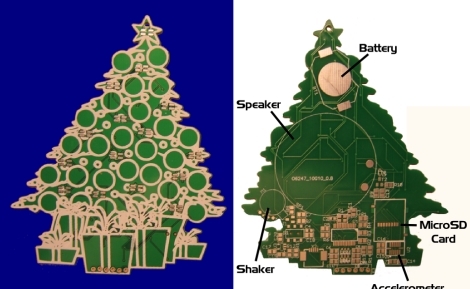 Different designs were laser cut into each piece of plastic – candy canes for the ‘red’ piece, stars and tinsel for the ‘yellow’ piece, and the tree for the ‘green’ piece. LEDs of the respective colors are cemented to the bottom of each bit of plastic. It’s called light piping and is used everywhere. This is the first time we’ve seen three colors, though. [Rickard Dahlstrand] was playing around with his phone trying to take deliberately fuzzy pictures of his tree. He noticed the dashes produced from the LED Christmas lights must be produced from PCM dimming. Going through the EXIF data in the picture, he found the exposure time was 1/17th of a second. 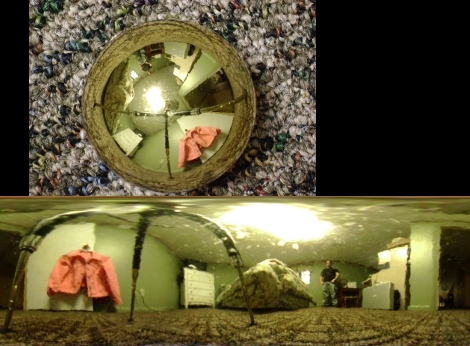 1/17 of a second = ~ 58 ms / 5 (cycles on the picture) = ~11 ms per cycle = ~100 Hz frequency on the PCM dimming. Of course this is just about 2 times the line frequency in [Rickard]’s native Sweden, so we’ll call this confirmed. There’s no blog post for this, but we’ve never seen a clearer example of applied geekery. Simply awesome. In the spirit of giving, [Johannes] decided to tell the entire world exactly how nerdy he is. 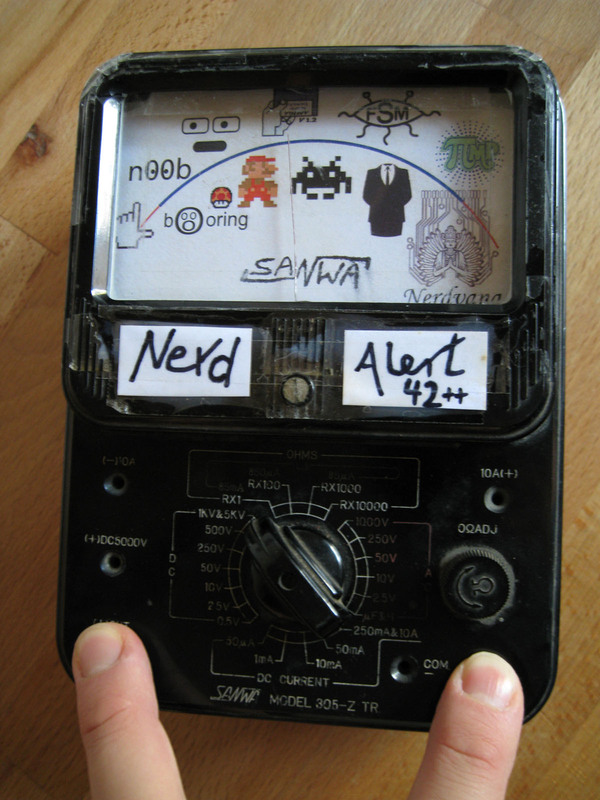 He built a ‘Nerd Alert’ meter out of an old 1950s Japanese multimeter. 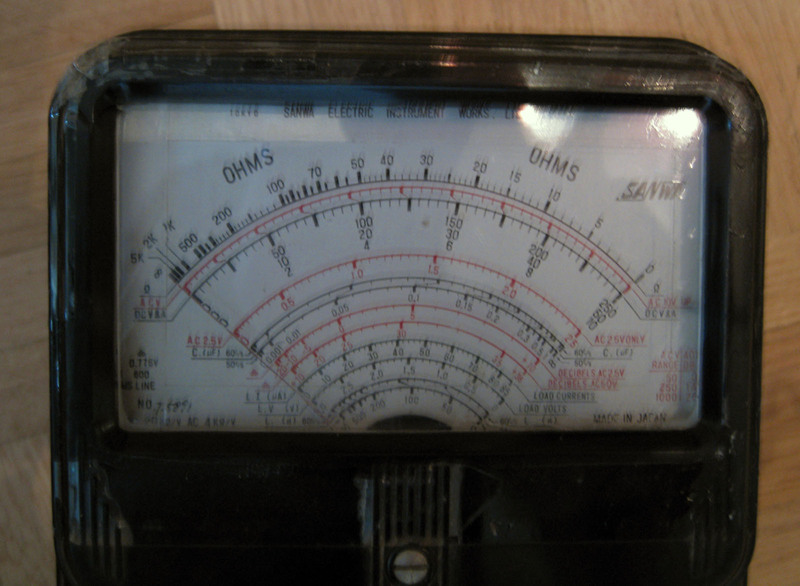 The old guts of the meter were chucked, and a simple amp made out of a transistor amplifies the current flowing through the user’s fingers. A neat scale ([Johannes] measures somewhere between Amiga Workbench and Space invaders) replaces the old, boring, number-based one. Again, no write-up, but here’s some awesome build pictures. [AUTUIN] took apart a vacuum tube with a blow torch and a diamond cutting wheel. Surprisingly, he was able to put it back together, but not before making a wonderful Christmas ornament. 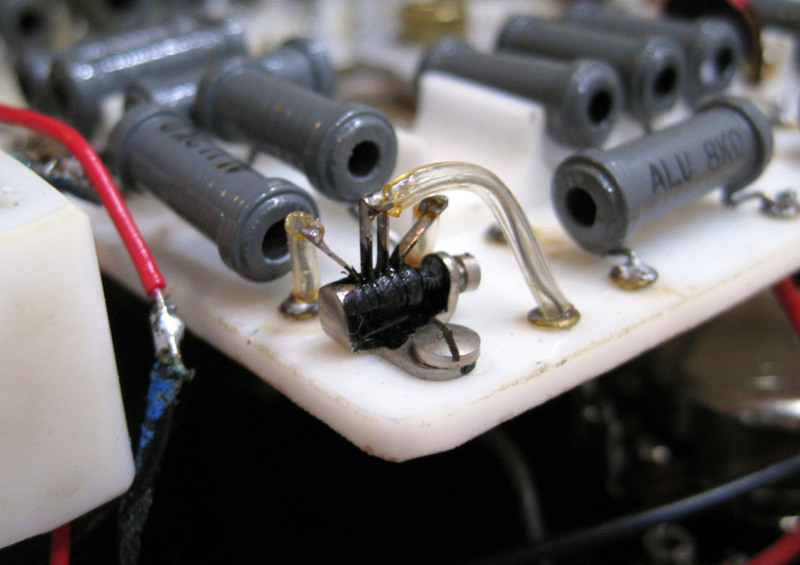 There are two copper wires inside the envelope that are the leads to a single orange-red LED. The whole thing is powered by a watch battery. We’ll be sure to reference [AUTUIN] next time we have to take apart a glass bulb, because he managed not to burn, cut or blind himself. Six things in a links post? It’s a Christmas miracle! [Darryl] sent in a nice tool to select and display all of the hacker/maker merit badges available from Adafruit. Oh, we’re still trying to figure out who to give 10 badges to. We’re giving away skull ‘n wrench badges to the top ten hacks ever featured here. Leave a note in the comments, or tell us who should win. [Dave Vandenbout] says that his sister has gotten big on Christmas traditions, and decided that the whole family should start making ornaments for the tree each year. Not one to let a chance to tinker with electronics pass him by, [Dave] started brainstorming the perfect electronic ornament for their tree. He settled on the Christmas tree design you see above, which will eventually hold 15 RGB LEDs. On the back of the board, he is planning on mounting a PIC 18F27J53 microcontroller, which will take care of the LED display along with his other more mischievous components. You see, undeterred by his sister’s holiday spirit, [Dave] wants to arm the ornament with a foul mouth, and have it attempt to shake other ornaments off the tree. To do this, he’s installing a vibrating motor on the back of the PCB, along with a speaker and MicroSD card to provide the ornament’s sound bites. We just hope he sends some video our way once he wraps up the project. If you’ve gone to the trouble of building your own CNC mill we know you’re always on the lookout for things to use it for. [Boris Landoni] wrote in with just the thing for the holiday season; a set of lighted acrylic Christmas ornaments. One of the interesting properties of acrylic is how it reacts when edge-lit. The material pipes the light, until it bounces off of a disturbance in the surface. The first step is to design the outline of the ornament as all cut edges will glow. Next, [Boris] uses artCAM to design the internal parts to be cut. This application translates the relief cuts necessary to really make your design shine (sorry, we couldn’t resist). The best examples of this are the angel and candle seen above. Each of these acrylic pieces has a slot cut on the bottom to hug an LED. 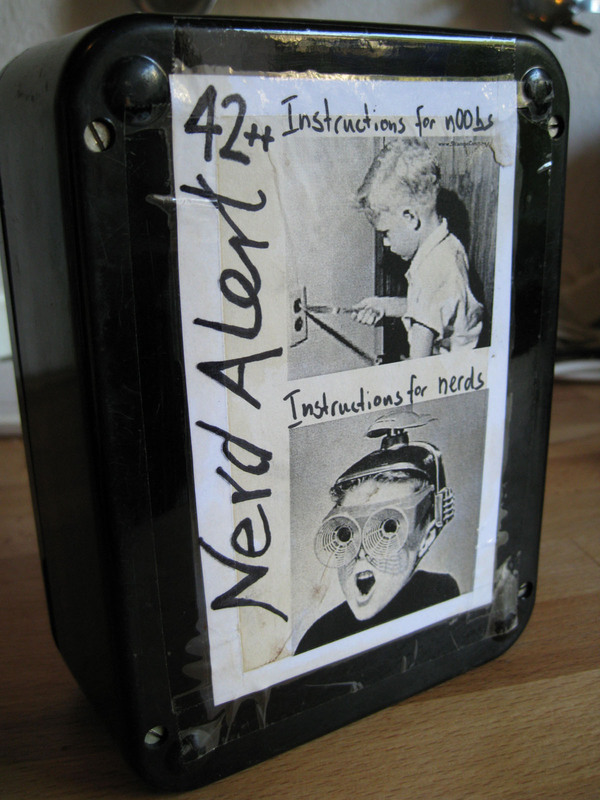 [Boris] used small project boxes with a PCB for that diode, as well as a button battery for power. When we introduced you to the Twitter Christmas tree ornaments, sadly we had very little information about the project. Luckily [Rob] made contact and clued us in on the inner workings. It even turns out we were wrong about the usage of Arduinos! We invite you to check out all the juicy inner workings after the break. Christmas may be over, but we still have a couple of cool holiday related hacks for you. One being [Alpay’s] Twitter based interactive Christmas tree ornaments. We tried to dig up some more information, but it thus far appears a laptop running Processing searches Twitter for specific Christmas related words (like 1337, that’s Christmas-y), sends a buffer to one of three Arduinos which in turn light up a specific ornament. You can check out a live stream here. For those wanting a bit more information on Arduino and controlling holiday lights, check out [Alpay’s] GE health care version of Twitter lights, or our previous post on controlling Christmas trees, or you might even try [Michael’s] $10 Walmart light controller.